Are gunowners handling guns more safely these days? 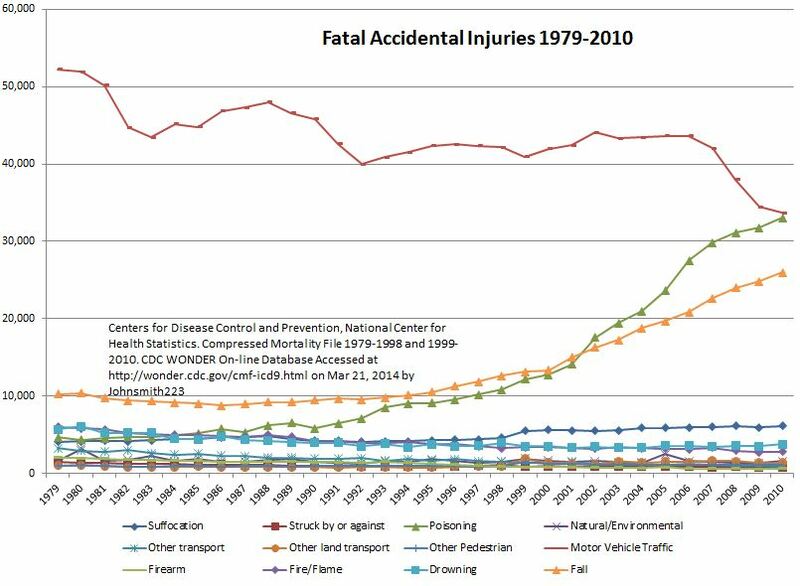 In response to a comment by David Yamane I’ve plotted the fatalities from many accidental injuries over 1979-2010. While it is far too cluttered to reveal much, four things are clear. First, auto accidents, accidental poisonings and accidental falls are the source of most fatal injuries. Second, we’re doing a great job of reducing auto fatalities. Third, accidental falls are way up, and I don’t know why. Fourth, accidental poisonings is a huge crisis. In fact, it is the number one cause of death for those 25 to 64. I believe that most of this is due to opiate and heroin addiction, and I also believe that the public health response appears to be entirely inadequate. Removing the worst three, as well as difficult-to-intepret categories such as “other transportation” and “other pedestrian”, we see an increase in suffocation fatalities, but decreases fire, drownings, firearms and “struck by or against”. 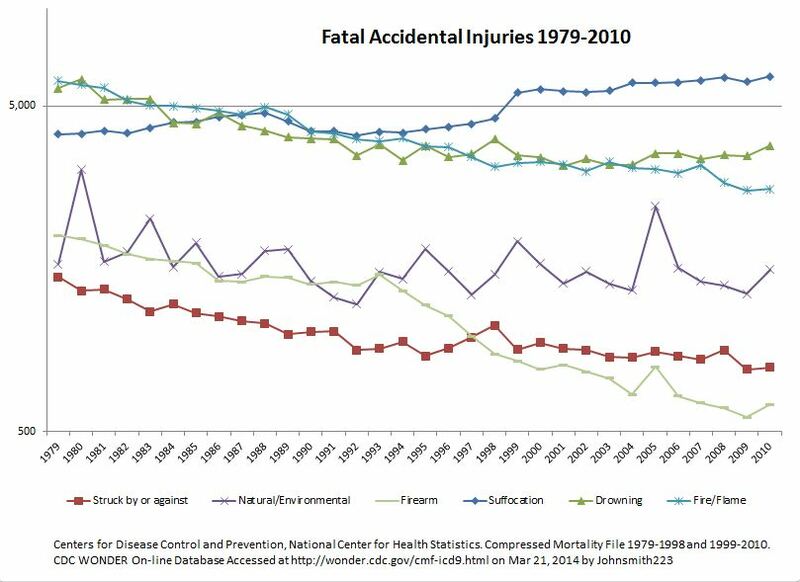 That lends credence to the view that better EMT services are partially responsible for the decline in firearm deaths. Plotting the vertical axis in log10, we see that firearm fatalities have drifted down more quickly than others, in spite of a large increase in the number of firearms. 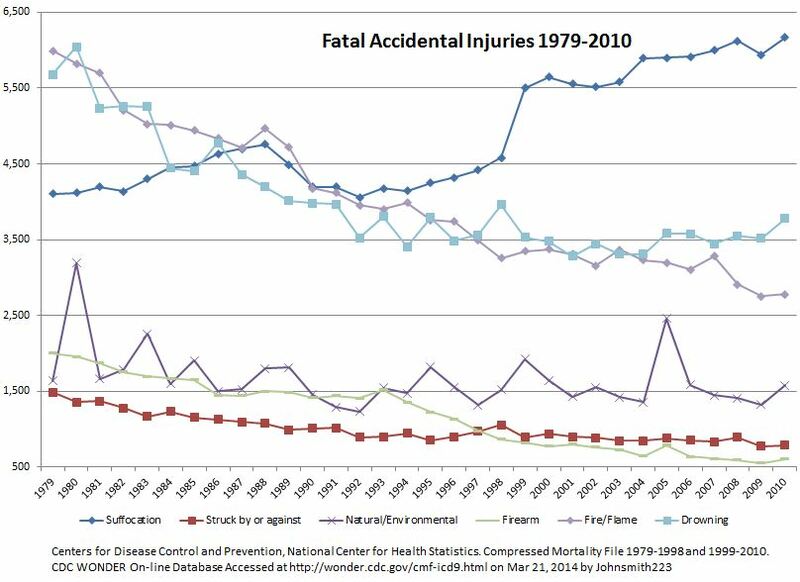 That suggests that gunowners themselves are somewhat responsible for the decline, although it could be the case that EMT services have just become particularly apt at treating gunshot wounds. 1 Response to Are gunowners handling guns more safely these days?